It's Tuesday, which means it's time for another round of "would you rather," the game that asks you to make the tough choices. Or at least, they're supposed to be hard choices. In last week's question, "would you rather free Princess Leia or Marta," a whopping 78 percent voted to save Leia. This week, we'll be deciding on the ultimate living space. You're in the market for a new place to live and stumble across a website for something called Intergalactic Apartments. When you load up the website, you discover they have the ability to send you across time and space to rent an apartment aboard a space station in the future. 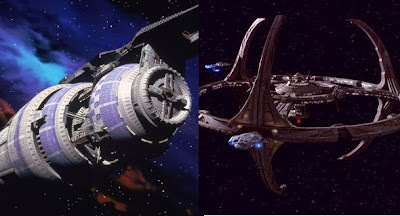 You can choose to rent an apartment on Deep Space 9 or Babylon 5. Which would you choose? The time jump will only work once to send you there and send you back. You can only travel to one space station or the other. You can't go to both. Intergalactic will only send you on the trip once in your lifetime. You'll be signing a one Earth year lease with no option to renew. At the end of the lease, you'll be returning to your own time period. You can do whatever you want aboard the station - get a job, make friends with the crew - although getting your own spaceship or a ride on a spaceship will be prohibitively expensive. So count on spending all your time on the station. DS9! Best Star Trek show ever. Alex is correct...DS9 is superior. Next Generation was still my favorite. I chose DS9 too, seems to have less fighting going on. Although, I could be wrong. Honestly, this is super tough. I'm going with Babylon 5 only because I watched that show before DS9. I'm choosing Deep Space 9. This is so easy. I liked certain aspects of B5, but I loved DS9. Everything about it. I'd love to live there. Your, ah, one word was misspelled. It's "Ferengi." Babylon 5. Far better show.